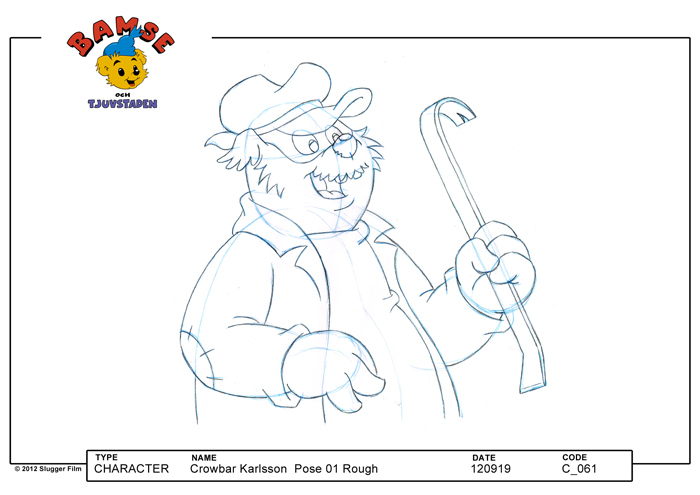 During the production of Bamse och Tjuvstaden, we spent the first five or six months designing everything. And by everything I mean EVERYTHING. From big locations down to trees and leaves, from houses and cars to gas pedals and tea spoons. 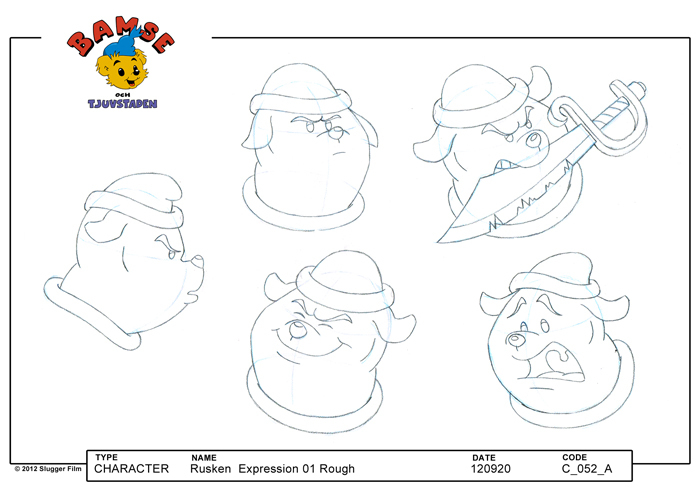 I worked in character design, in the first instance making turnarounds to show the animators what the characters look like in different angels, and secondly drawing expressions and poses, which tell a little more about who the characters are. 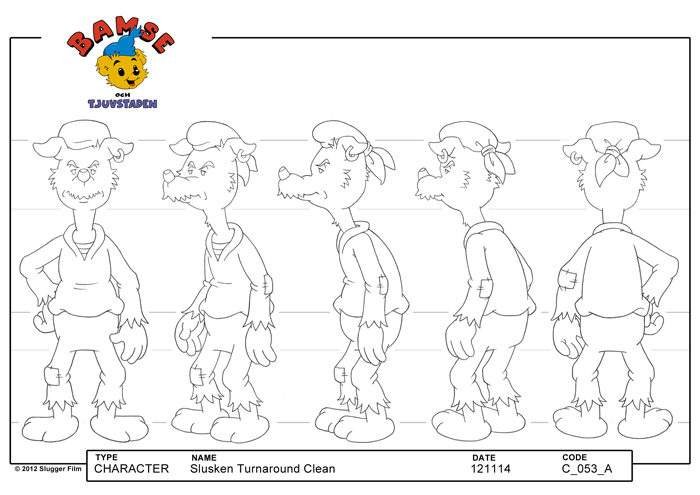 The producer was kind enough to let me post some character design sheets for some of the crooks. None of these characters are new. Basically what we did was adapting them for the big screen. Turn for Slusken, one of the pirates. The reason the lines are pretty is Li-Chuan Chang, Sluggerfilm‘s amazing clean up artist. Some expressions for Rusken, another pirate. 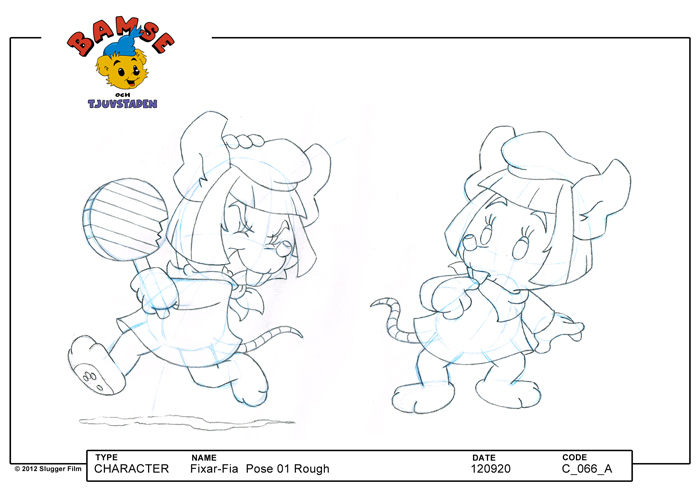 There are many voles in the film. This is Farliga Flisan. And here’s her friend Fixar-Fia. An old favorite Bamse crook of mine, Kofots-Karlsson. Bamse och Tjuvstaden will premiere January 2014.
ⓒ Tre Vänner produktion AB. Based on Bamse’s universe created by Rune Andréasson and published by Bamse Förlaget. 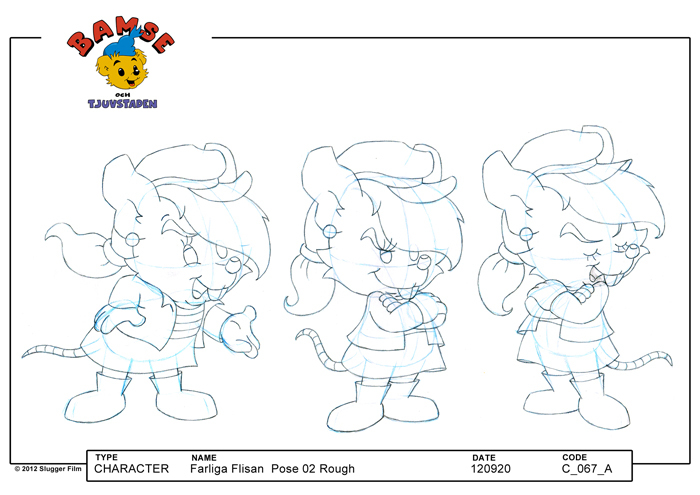 This entry was posted in Animation, Bamse movie, Character Design by Andreas Qassim. Bookmark the permalink. Thank you Maciek. Yeah, it’s a pity the movie only comes in Scandinavian languages. If the second movie does well, maybe they’ll make an English version? Let’s hope so. I actually remember seeing a polish Bamse-magazine from the 90s. What was Bamse called in Polish?